My friend Lauren is having a baby in about a month. And she still wears heels just about every day. She wore them to the shower. She wears them to work and church. She has dozens of them. 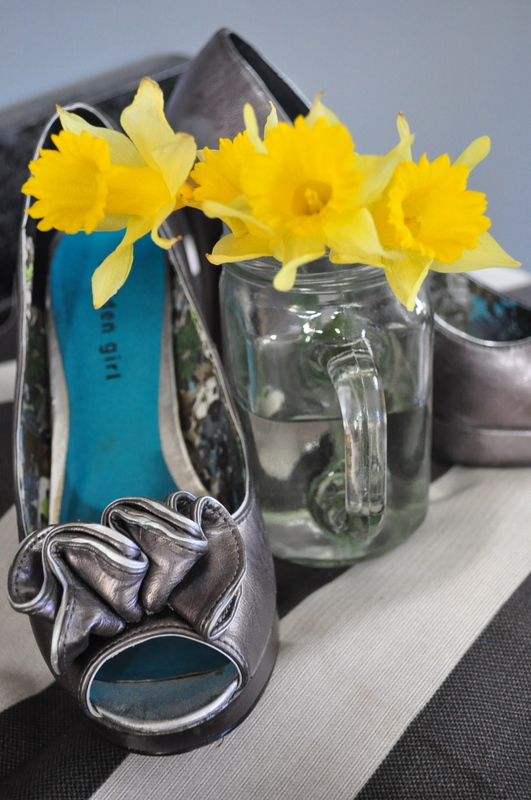 So when we set out to plan a baby shower to welcome her little girl and to honor Lauren, we thought what better theme for a girly party than high heels? 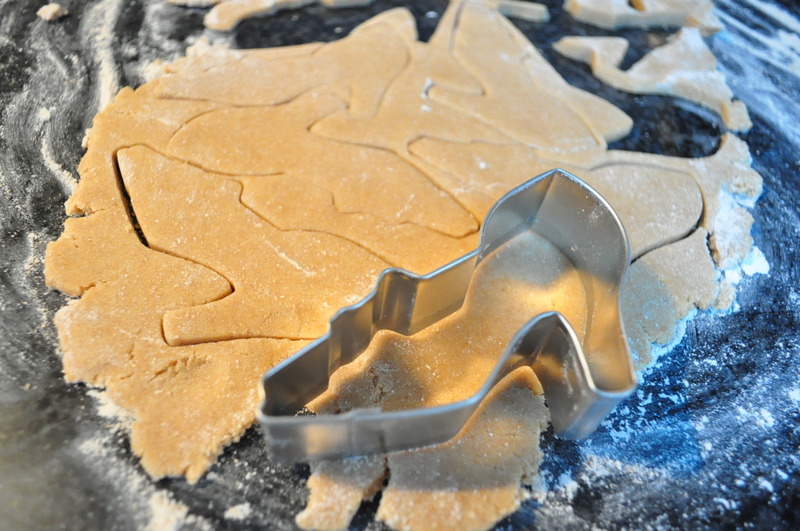 I was giddy to find a cookie cutter in the shape of a high heel on Etsy. 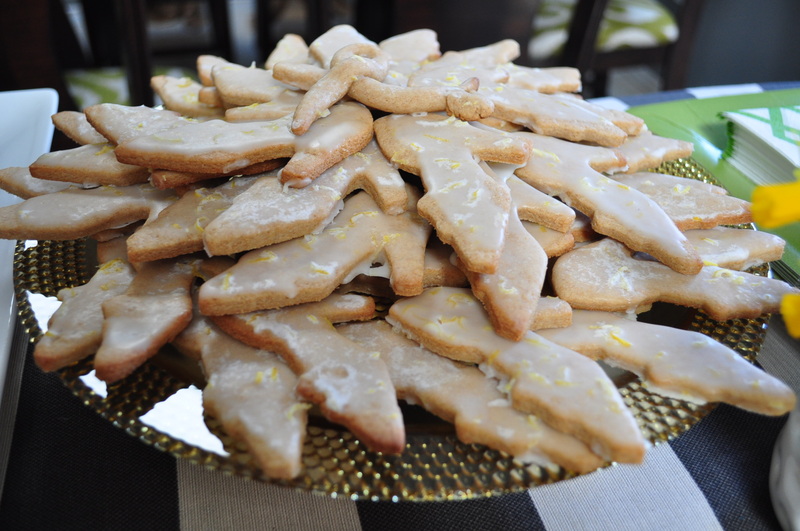 I used it to make sugar cookies with a lemon drizzle icing, the recipe for which I’ll include below. 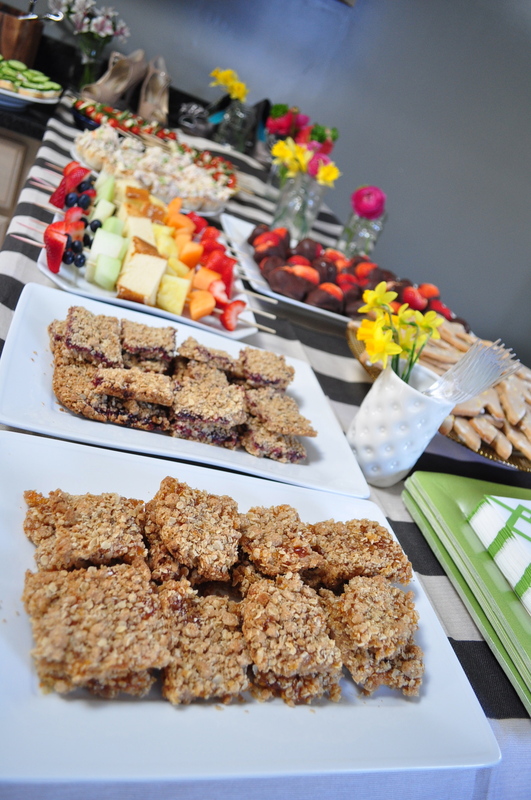 With the help of three amazing co-hosts, we put out quite a spread. 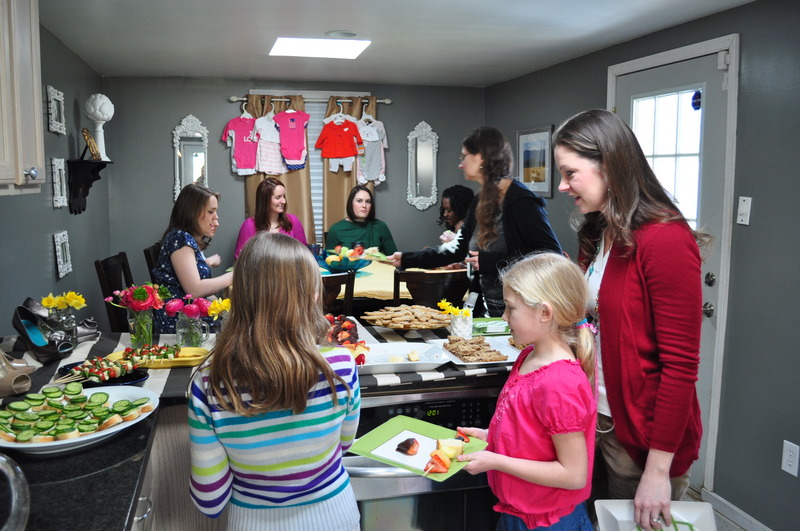 Truly, the way to host a party is with help. 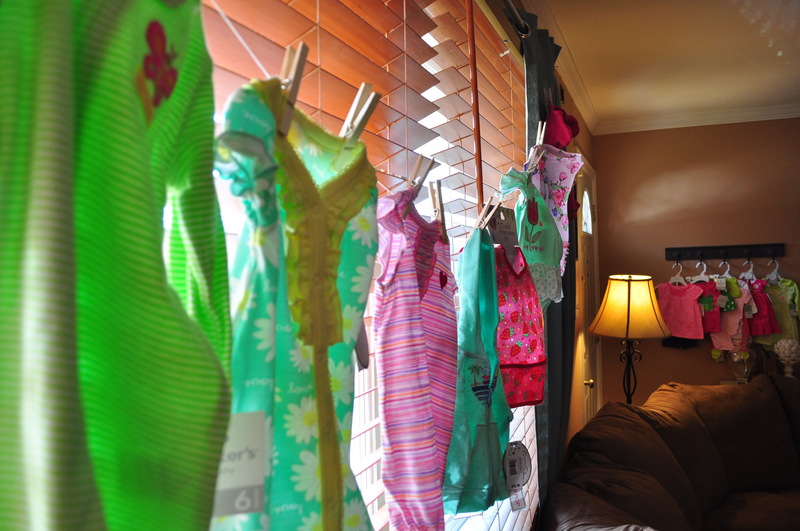 And a great way to save on decorations — and not end up with a bunch of decor you don’t want — is to use baby clothes. We decorated by making swags out of onesies and outfits, hanging them on every surface that made sense. And our guest of honor requested we each sign baby or children’s books instead of cards — which was a great idea. 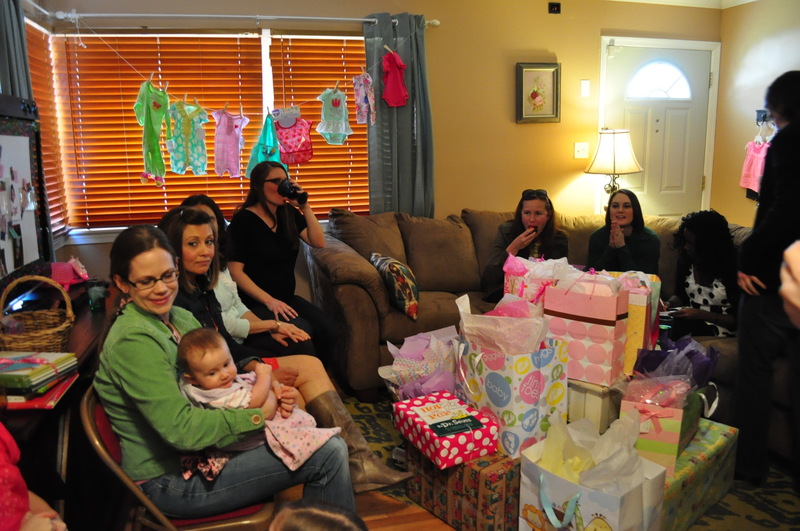 I mean, who keeps baby shower cards anyway (OK, I would, but I’m a card hoarder). And I put to use the talents of a dear friend who just started her own bow-making biz on Etsy. 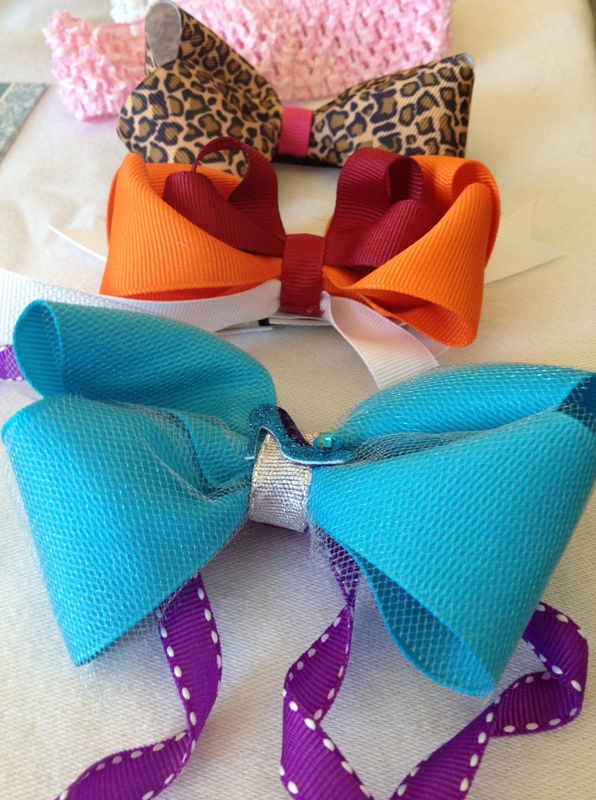 She custom made these three bows for me, one with the high heel theme of the party, one for Lauren’s alma mater, Virginia Tech, and one because all girl babies should have a little leopard. There’s still time to have her make your little one a precious Easter bow! 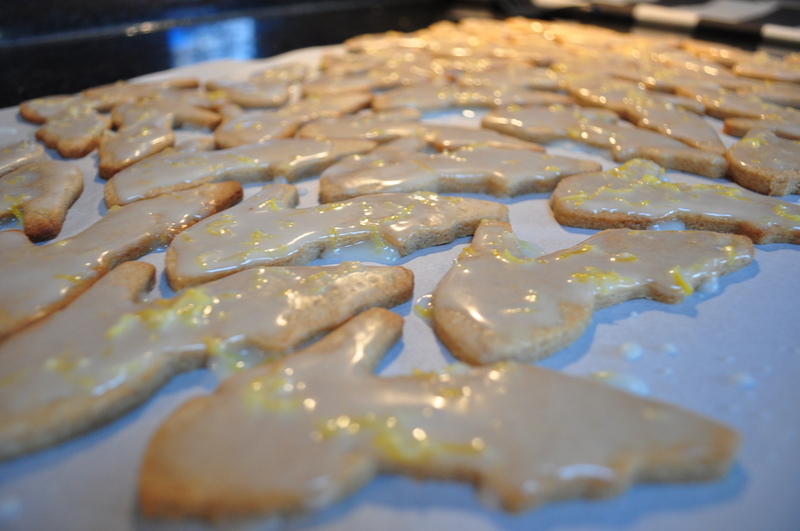 So, without further ado, the sugar cookie recipe. This one worked really well for cookie-cutting. It didn’t expand and bleed past its cute boundaries in the oven and was not overly sweet. I think the flour you use matters, and the King Arthur all-purpose I included may have made all the difference. The lemon frosting adds another depth of flavor, a zing and freshness and just enough tart. I did have a lemon wedding cake, so I might be biased. I know some people still expect a sugar cookie to taste like, well, sugar. So let’s call this a sugar cookie for grown-ups. Oh, and the lemon zest sprinkled throughout? That’s grown-up sprinkles. Makes about 30-40 cookies, depending on cutter shape. Or 2 1/2 dozen rounds. 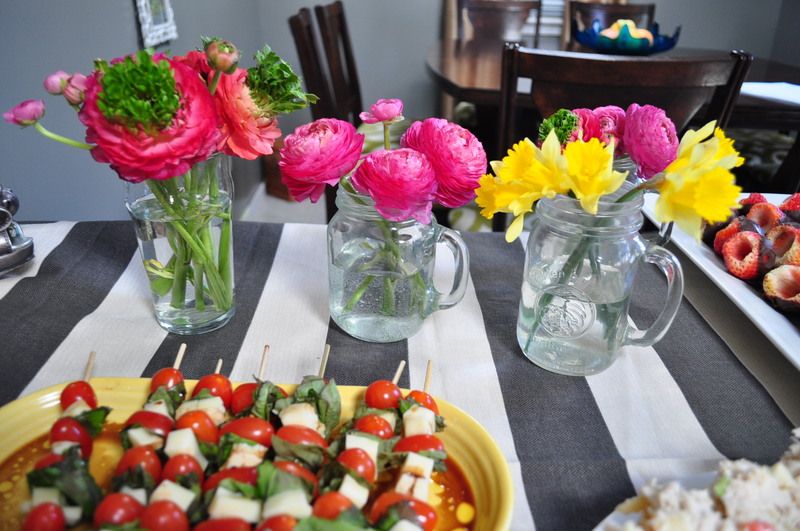 Adapted from All Recipes and a little Martha Stewart. In a large bowl, cream together butter and sugar until smooth. Beat in eggs and vanilla. Stir in the flour, baking powder, and salt. Cover, and chill dough for at least one hour, or overnight. If chilling overnight, give it some time on the countertop to soften before hitting it with the rolling pin. It will soften with a little elbow grease. Preheat oven to 400 degrees F. Roll out dough on floured surface 1/4 to 1/2 inch thick. Cut into shapes with any cookie cutter. Place cookies 1 inch apart on un-greased cookie sheets. Bake 6 to 8 minutes in preheated oven. Remember, they will continue cooking on the pan until you spatula them off onto a cooling rack or paper towels. So I’d lean toward the 6-minute mark for light-colored, soft cookies. Cool completely. Whisk together frosting ingredients in a medium bowl until smooth. Arrange cooled cookies close together on parchment paper or paper towels. 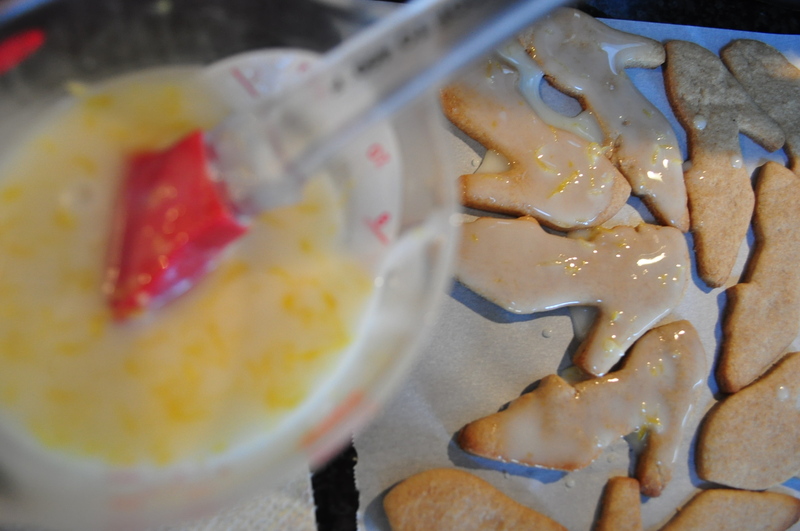 Use a pastry brush to liberally brush frosting onto each cookie, brushing the excess from one cookie to another. The amount of frosting should be more than enough, so don’t be afraid if some gets between the cracks (the more for you to “clean up”… with your finger later). 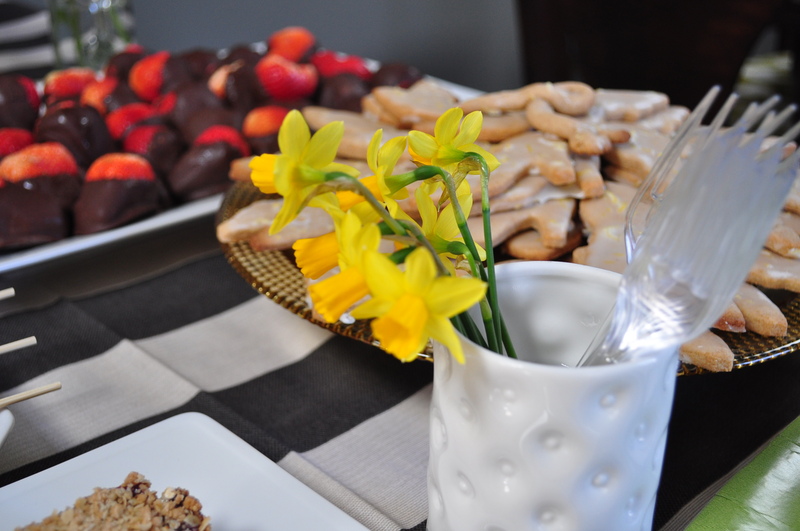 Allow frosting to dry and harden until opaque, about 15 to 20 minutes, before stacking or arranging on platters. This recipe would be great for making Easter bunny- or egg-shaped cookies for the upcoming holiday (my personal favorite of the year). He is Risen! Really nice post! The cookies look great! Thanks! They taste(d) really great, too. Hope you find an excuse to make them! I’m so glad Dave. Thanks for commenting — and for sharing your lovely daughter with us!